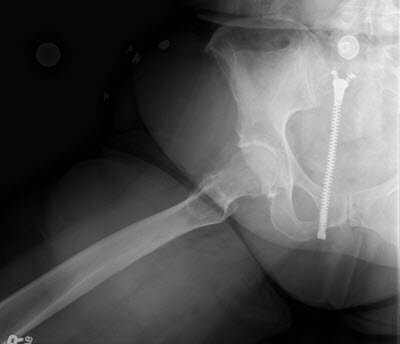 A 65-year-old female presents with severe pain in the right groin area that worsens with activity. When she’s diagnosed with advanced degenerative joint disease of the right hip, the authors recommend a total hip arthroplasty, and they deem her a good candidate for the procedure through the direct anterior approach. Total hip arthroplasty (THA) has conventionally been done through the direct lateral or posterior approach. An alternative is the direct anterior approach (DAA), which utilizes Hueter’s interval between the tensor fascia latae and sartorious to obtain exposure of the hip. It is considered to be a true inter-nervous, inter-muscular plane approach. Proponents of the DAA claim it causes less muscle damage and pain than other approach to THA, as well as allows for more rapid recovery after hip replacement. Unique complications associated with the DAA have been described, however, and there are no data available that demonstrate improved long-term outcomes associated with the DAA. The DAA was first described by Hueter in 1881, and in the American literature by Smith-Petersen in 1917. [1,2] It was largely abandoned due to the risk of complications and the popularity of the posterior approach as advocated by Charnley. The DAA can be performed using a hip fracture table as reported by Matta  and many surgeons continue to use a fracture table, while others have described using the procedure with a standard OR table, [4,5] as well as the use of special instruments. The aim of this case report is to illustrate a case in which the DAA was used. A 65-year-old female with history of hypertension presented to the authors’ office after several years of pain and discomfort in the right groin area. She described her pain as severe in quality, worsening with activity, and limiting her activities of daily living. Her walking tolerance was reduced; pain and restriction of function were intolerable at this time; and the pain was not diminished with activity modification, anti-inflammatory medications, and pain medications. Joint space narrowing and joint subluxation noted on image review. Figures 1 and 2. Preoperative anteroposterior (top) and lateral (bottom) X-rays. The patient failed conservative treatment. After appropriate medical clearance, she was considered a good candidate for THA through the DAA. Some surgeons prefer the DAA because it allows for preservation of the posterior soft tissue structures, therefore decreasing the risk of hip instability and dislocation. Critics of the approach, however, believe the risk of fractures and the complexity of the approach can lead to complications. Indications for surgery with the DAA are the same as for THA through other approaches. The ideal candidate for DAA is a thin female with a long neck and valgus hip. Obese male patients with a short neck and a varus hip are, in general, more difficult when first learning the DAA. 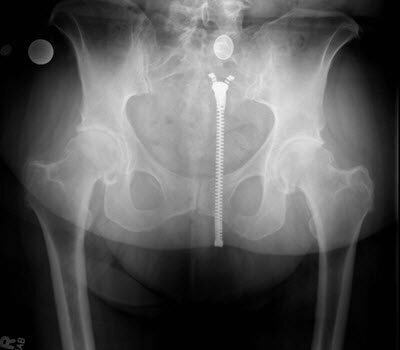 Other patients to avoid as first cases are those who have hips with large contractures, protusio, or substantial shortening, and those who have had previous hip surgery or those with retained hardware. The patient was placed in the supine position on a regular table, with an arm board placed at the end of the table opposite the operative side and both legs draped. This position allows anatomic orientation of the pelvis, proper positioning of the implants, and easier leg length restoration. The authors do not use special tables for the DAA, preferring a standard OR table (Figure 3). A bump (3 inches thick and 8 x 15 inches in size) was used to elevate the pelvis and to provide extension of the femur. The bump is typically centered below the anterior surerior iliac spine (ASIS). Care must be taken that the bump is positioned correctly as to not cause pelvic tilt. Figure 3. 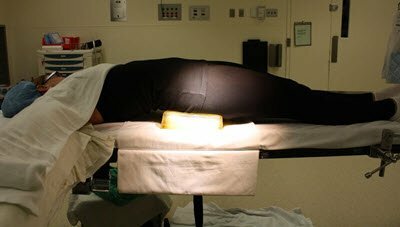 Positioning for the DAA on a standard operating table. Neurovascular bundle containing the femoral artery and vein and the femoral nerve, running medial to the sartorious. Knowledge of the location of the neurovascular bundle is critical during all portions of the DAA. The DAA requires unique instruments. The authors use a femoral elevator to improve exposure of the proximal femur, placing it behind the greater trochanter and at a 45° angle to the shaft of the femur. The authors use a blunt Hohman’s bent in 2 places to protect the soft tissues and improve acetabular exposure. Other special instruments can be used for the left or right side and include double offset reamers, curved cup impactor, a starter broach, and a double offset broach handle. Additional illumination is needed for visualization of the acetabulum. 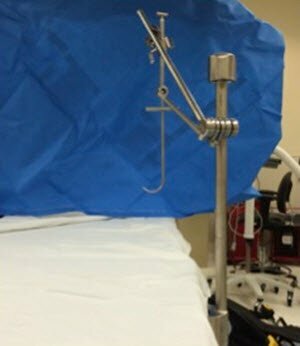 This can be either mounted lights or light pipe system connected to a retractor. 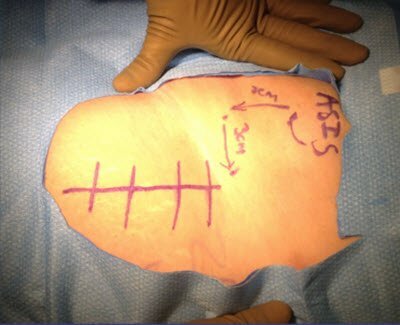 Make the first incision approximately 3 cm distal and 3 cm lateral to the ASIS. For most patients, this point will lie near the groin crease (Figure 4). Figure 4. Initial incision, approximately 3 cm distal and 3 cm lateral to the ASIS. From the starting point, extend the incision distally and laterally. Over the TFL, it is carried down to the level of the fascia over the TFL. It is critical at this juncture to confirm the location of the TFL.Typically, there will be several perforating vessels that enter the TFL at the mid portion of the body and are used to confirm the correct location. QUICK TIPS: (1) Keep lateral to the ASIS; (2) find the perforating vessels (Figure 5); and (3) expect thickening of the fascia over the abductor. Figure 5. Locate the perforating vessels that enter the TFL. Use blunt digital dissection to go superiorly and medially, following the fat strip, over the superior aspect of the femoral neck. Place a blunt retractor over the extra-capsular superior neck, and then place another sharp retractor medial to the TFL and over the lateral edge of the femur, just distal to the intertrochanteric ridge. Carefully coagulate the large vessels between these two muscles (divisions of the ascending branch of the lateral femoral circumflex artery). Once the muscles are safely separated, place a second blunt retractor over the extra-capsular inferior portion of the femoral neck. Figure 6. Femoral elevator in place to improve exposure of the proximal femur. Place a blunt retractor over the anterior aspect of the acetabulum, which will relax the rectus femoris and the femoral vessels. The authors typically use a lighted retractor for this step. Using the electrocautery, gently release the reflected head of the rectus to improve exposure. This should provide an excellent view of the hip capsule. 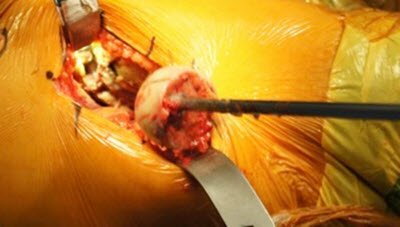 Perform a capsulectomy or capsulotomy to allow visualization of the femoral neck. 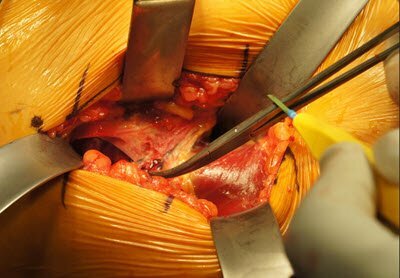 Place 2 retractors in an intra-capsular position to protect the soft tissue during the femoral neck cut. Using an oscillating saw, make the femoral neck cut in situ and remove the femoral head. The authors find it easier to make 2 cuts in the femoral neck, creating a “napkin ring” of bone, (Figure 7) that allows removal of the bone and femoral head separately. Figure 7. Double neck osteotomy of the femoral neck. Use a corkscrew to remove the femoral head (Figure 8). Figure 8. The acetabular will be exposed after removal of the femoral head with the assistance of a corkscrew. Move 1 of the blunt retractors so the tip is over the transverse acetabular ligament, retracting the inferior hip capsule and iliopsoas tendon. Split the inferior hip capsule using the electrocautery to allow for insertion of this retractor and to improve exposure. Reposition the sharp retractor to the posterior aspect of the acetabulum (Figure 9). Figure 9. 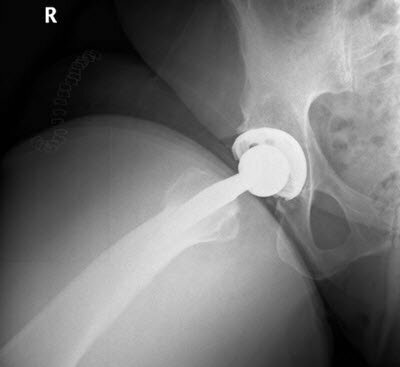 Acetabular exposure after resection of the superior capsule. Once the labrum and cotyloid fat are removed, begin reaming. Offset acetabular reamers and offset cup insertion handles are available to assist in reaming and placement of the cup. There is a tendency to excessively antevert and abduct the cup, especially when early in the learning curve, and efforts should be made to avoid this. Once the cup is positioned, begin exposure of the femur. As is the case with all THA approaches, the natural position and angle of the femoral shaft will not allow safe broaching and preparation for femoral stem placement during the DAA. The most important, and difficult, step when using the DAA is elevation of the femur to allow for broaching. To accomplish this, first move the femur to a position of adduction and external rotation. If the patient has been positioned appropriately, the table can be flexed at this point, allowing extension of the leg. This maneuver will better align the femur for broaching. If using a special table, this can be done with the assistance of the table. The authors utilize a special femur elevator, known as the retracting arm, which makes this step more predictable (Figure 10). Figure 10. A special retracting arm makes femur elevation more predictable. When using the arm, the authors place the hook under the femur, just below the greater trochanter, with the arm attached to the bed. They lift the hook to lift the femur, putting some tension on the femur, and then move the leg to external rotation and adduction. Benefits of using the arm include the following: controlled release; case is more predictable; fewer releases means more stability; solid foundation for broaching; less damage to the muscle means better recovery. Place the Muller retractor over the superior portion of the trochanter and posterior portion of neck. While applying some tension with the arm, perform a soft tissue release. The most important release is the posterolateral corner of the piriformis fossa, which will allow for anterior translation and will provide enough exposure for broaching and stem implantation. QUICK TIPS: (1) Use a canal finder to prevent perforation of the femur (Figure 11); (2) Understand how to avoid varus of the stem; and (3) once the hip is reduced, use a bone hook to help with dislocation. Use offset broach handles to assist in safe and accurate broaching and seating of the femoral stem. With the trial head and neck on a broach, reduce the hip and use X-ray to confirm broach size and position if desired (Figure 12). Figure 12. Special instruments can be used for the left or right side. Recheck the circumflex vessels to ensure they have not started bleeding and close the fascia of the tensor. The patient was out of bed and walking the day of surgery. She was discharged on POD1, as are 90% of the authors’ patients who undergo a THA through DAA. As part of their protocol, the authors did not order formal therapy after discharge, preferring self-directed therapy and walking. The patients’ postoperative X-rays are see in Figures 13 and 14. The DAA is said to cause less muscle damage and less pain, to speed recovery, and to allow for better gait mechanics postoperatively. However, literature to support these claims is scant. Most studies are retrospective, and the two randomized trials are underpowered and lack strict scientific evaluation. A common refrain among proponents of the DAA is that it causes less muscle damage than other approaches for THA. [7-9] Again, there is little in the literature to support such claims, although studies are under way. 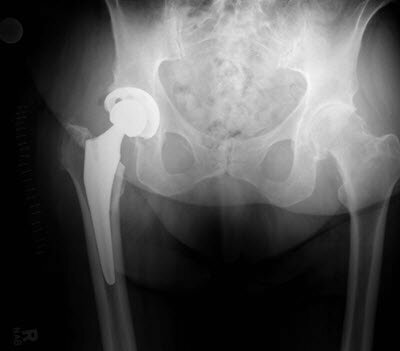 The DAA for hip replacement has gained in popularity as patients’ demand for less-invasive surgical techniques has increased. Modern instruments in combination with specially designed tables have made this technique more accessible to orthopaedic surgeons. However, the learning curve is steep and can be fraught with complications as the surgeon becomes more adept at the procedure. As familiarity with the DAA for hip replacement permeates the orthopaedic community, it should become more commonly taught and available to community surgeons. Victor H Hernandez, MD, MSc, and Zachary Post, MD, are from The Rothman Institute, Philadelphia, Pennsylvania. They specialize in adult hip and knee reconstruction. Kennon RE, Keggi JM, Wetmore RS, Zatorski LE, Huo MH, Keggi KJ. Total hip arthroplasty through a minimally invasive anterior surgical approach. J Bone Joint Surg 2003;85:39. Kennon R, Keggi JM, Zatorski LE, Keggi KJ. Anterior Approach for total hip arthroplasty: beyond the minimally invasive technique. J Bone Joint Surg Am 2004;86-A(Suppl 2):91. 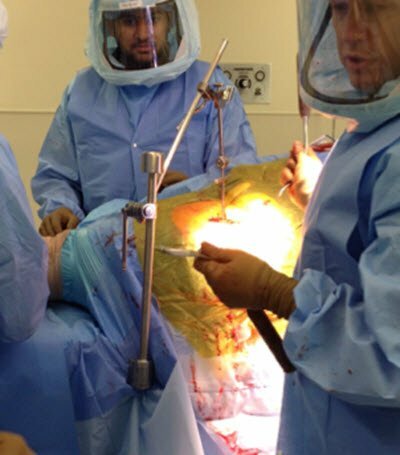 Matta JM, Shahrdar C, Ferguson T. Single-incision anterior approach for total hip arthroplasty on an orthopaedic table. Clin Orthop Relat Res 2005;441:115. Lovell TP. Single-incision direct anterior approach for total hip arthroplasty using a standard operating table. J Arthroplasty 2008;23(Suppl 1):64. Bender B, Nogler M, Hozack WJ. Direct anterior approach for total hip arthroplasty. Orthop Clin North Am 2009;40(3):321. Berger RA. Total hip arthroplasty using the minimally invasive two-incision approach. Clin Orthop Relat Res 2003;417:232. Bremer AK, Kalberer F, Pfirrmann CW, Dora C. Soft-tissue changes in hip abductor muscles and tendons after total hip replacement: comparison between the direct anterior and the transgluteal approaches. J Bone Joint Surg Br 2011;93(7):886. Bergin PF, Doppelt JD, Kephart CJ, Benke MT, Graeter JH, Holmes AS, Haleem-Smith H, Tuan RS, Unger AS. Comparison of minimally invasive direct anterior versus posterior total hip arthroplasty based on inflammation and muscle damage markers. J Bone Joint Surg Am 2011;93:1392. Meneghini RM, Pagnano MW, Trousdale RT, Hozack WJ. 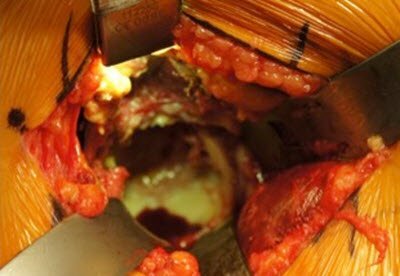 Muscle damage during MIS total hip arthroplasty: Smith-Petersen versus posterior approach. Clin Orthop Relat Res 2006;453:293-8. Zachary D. Post, Fabio Orozco, Claudio Diaz-Ledezma, William J. Hozack, and Alvin Ong. Direct Anterior Approach for Total Hip Arthroplasty: Indications, Technique, and Results. J Am Acad Orthop Surg September 2014 ; 22:595-603.